Piotr Hallmann was born in Gdynia, Poland on August 25, 1987. He is the first professional athlete from the Hallmann family. His fascination for sports was already apparent at a young age when he started training karate at the age of six. After other endeavors in football and capoeira, he eventually started training in mixed martial arts together with his friend and fellow professional fighter Marcin Gulas in 2008 and started competing one year later. His rise through the ranks was nothing but meteoric: Still competing as a welterweight, “Płetwal” racked up four wins in his first four professional fights, all of them by knockout. The marquee win of his early career was a K.O. victory over KSW veteran and Mamed Khalidov training partner Kerim Abzailov. The win gave him the opportunity to fight for the vacant GMC European Championship on short notice, but insufficient preparation time forced him to retire early in the fourth round. The lone setback of his career lit an even bigger competitive fire under Hallmann, who went on to win all four of his 2011 fights. Two of those wins came in an 8-man, single night, no rounds, no time limits “old school” tournament that he ended up winning with a 12-second knockout over Georgian judoka Avtandil Shoshiashvili as well as a submission victory over Chechen fighter Tamirlan Dadaev after an 11-minute war. 2012 proved to be the most successful year of Hallmann’s young career so far. Dropping down to the 70kg weight class prompted another explosion in performance as he first defeated English pro boxer Kevin Donnelly in his first fight outside of Europe in Amman, Jordan. He then travelled to Finland to retire 28-fight veteran and former European Top Ten ranked Jarkko Latomäki with another first round knockout. 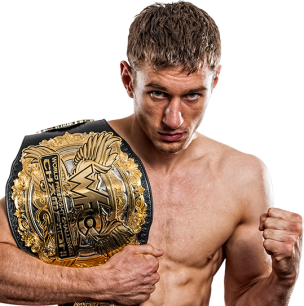 In his biggest achievement, Hallmann had the opportunity to fight Montenegrin wrestler Vaso Bakocevic for the vacant WFC lightweight title on two weeks’ notice. Despite having negative experiences with taking fights with little time to prepare before, Hallmann travelled to Ljubljana, Slovenia and ended up stopping Southern Europe’s strongest lightweight on several nasty cuts early in the second round. It was the first major European title for “Płetwal”. Besides fighting, the student of Polish MMA legend Grzegorz Jakubowski is serving as a Lieutenant in the Polish Navy. He is also a student of physical education at the Polish Naval Academy.